First, I will just address the elephant in the room when it comes to pumpkin ales. 1) they are often over-hyped and 2) it's hard not to compare every one of them to Pumpking (there I go over-hyping it). I enjoyed this from a 22oz bomber and poured into a Brooklyn snifter. The appearance is a brilliant copper hue which is exactly how a pumpkin ale should look. The head quickly dissipated and there is no trace of any lacing in the glass. The aroma makes you want to dive right in. Lots of sugary sweetness and spices. The taste follows suit. The pumpkin flavor takes the lead but is balanced nicely by the different spices. The finish is a bit sticky and pretty sweet with just a hint of the alcohol. I would never have guessed the ABV to be over 8% on this. The booze is masked well. 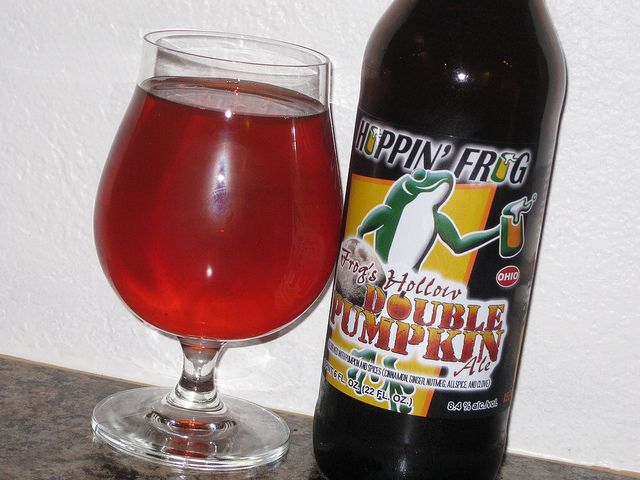 Overall, this is a solid pumpkin ale that is probably a bit over-priced for the quality. The mouthfeel is a tad too watery and more viscosity wouldn't hurt. If this were $7-$8 a bomber, it would easily be one of the best seasonals on the shelf. Regardless, it's still above average and in my top 5 pumpkin ales. I would love to try the barrel aged version of this!